"There sure are a lot of things out there that want to kill you." How do you handle everything from an aasimar to a horde of zombies without carrying enough gear to sink in a swamp? Sometimes adventuring isn't so much what you can do, as knowing when to do it. No adventurer can be prepared for every challenge they might face. The clever ones just know how to face the challenges they can't prepare for. These farsighted strategists and cunning tacticians calculate their odds as they swing their swords and loose their spells. They base decision on the likelihood of events, aiming to be ready for the inevitable, able to deal with the unlikely, and ready with a back-up plan for the impossible. 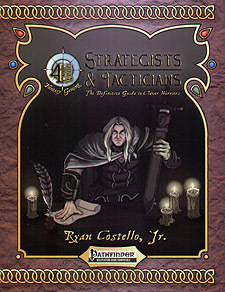 Strategists and Tacticians can make any character more versatile with variant class features for all the core classes, a dozen new prestige classes, spells for a variety of spellcasters, and over fifty feats that unlock new abilities and improve existing ones. New combat maneuvers allow you to throat hostages, sever limbs, choke your enemies, or take advantage of a free off-hand. Give characters a multiclass flavour from 1st level with the Apprentice, a special new one-level base class. All this and more in The Definitive Guide to Clever Warriors. Follow resident schemer Flynn Dielle's advice on preparedness, improvisation, and survival, and you could be the next adventurer to save a village from a dragon using a young cow, two rubber trees, and a bag of holding. It's like Flynn always says - "Even a pug can beat an orc wardog if he bites him where it hurts."